Disney has released a new movie on DVD, just in time for the Christmas holidays. The story is about Pooh and his friends who help a reindeer return back to the North Pole after being tangled in jingle bells. Their journey has it's challenges and the Super Sleuths are forced to build a shelter to survive the Arctic night. It's through this experience that Pooh releases what the true spirit of Christmas is; being together with your friends and family. 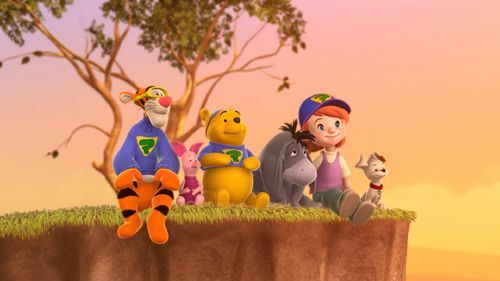 The film features Pooh and some of his new friends - Tigger, Pooh, Darby and Buster the dog. It's also produced using 3D animation, so looks quite different from the traditional Pooh movies. Many fans may disappointed not to see Christopher Robin, who has been replaced by the girl character Darby. The character Owl also makes an absence in this film. This is the same format in the newest TV series My Friends Tigger and Pooh which has proved popular. Their DVD contains French and Spanish language tracks. There's also a bunch of bonus features including games. The DVD also features Disney Fastplay, in which all trailers, feature movies and bonuses are played back to back - perfect for adults and kids to enjoy the DVD without any set up or complex menu. The DVD is released on November 20th 2007 and has a run time of 44 minutes, but with all the extras, it provides around 2 hours of entertainment. More information can be found on the official site, or you can pick up the DVD on Amazon.com.